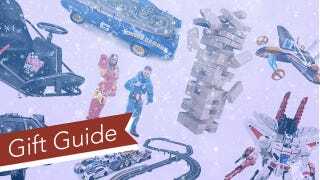 There's no shortage of gift ideas for kids when the holidays roll around, but what if you've got a couple of adults on your Christmas shopping list who still have an affinity for toys? They've probably outgrown a stocking full of Hot Wheels vehicles, so here are some more grown-up suggestions for adults who never actually grew up. It turns out that all those movie chase scenes were right, recklessly driving your car at breakneck speeds and drifting around corners is incredibly fun. Except you probably don't want to risk destroying the family sedan in the process. If you miss the Spiderman-themed bed sheets you grew up with as a kid, the makers of the Selk'bag wearable sleeping bags now have a more suitable alternative for adults. The company's released a collection of four Marvel-themed sleeping bags that make you look like Captain America, the Hulk, Iron Man, or America's favorite web-slinger. You can spend thousands of dollars on a detailed remote control plane or helicopter, and then completely wipe out your investment after a devastating crash. So if you want to dabble in RC flight on the cheaper side, and find quadcopters to be slow and boring, the Hot Wheels Street Hawk is worth every penny. Lego is one of the few toys that spans generations, and through the hard work and devotion of countless adult fans and builders, it's generally considered to be an OK pastime for grown-ups. So much so that Lego has actually started putting creations made by older Lego fans into production, like Brent Waller's perfectly-detailed Ecto-1 from Ghostbusters.